Scott J. Gilbert, MD, is the Nephrology Fellowship Program Director at Tufts Medical Center and an Associate Professor of Medicine at Tufts University School of Medicine. He is deeply involved in medical education from the first year of medical school through continuing medical education. At Tufts Medical School, Dr. Gilbert was involved with the complete redevelopment of the medical school curriculum, and now coordinates the integrated second year comprised of physiology, pathophysiology, pharmacology, and pathology. He is a recognized clinical leader for students as they rotate through their clerkships and fourth year electives. Dr. Gilbert remains active as Core Faculty in the Internal Medicine Residency Program, and has been the Nephrology Program Director at Tufts since 2006. 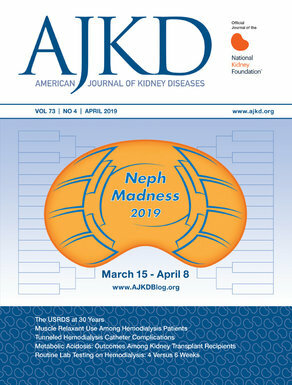 Dr. Gilbert’s other educational responsibilities include Education Editor for AJKD, where he oversees the Core Curriculum in Nephrology series and the Acid-Base and Electrolyte Teaching Case, the Imaging Teaching Case, and the Kidney Biopsy Teaching Case features. He is also editor of the 6th edition of the Primer on Kidney Diseases which will be published in 2013. Note: Although Dr. Gilbert's primary responsibility is AJKD educational content, he lends his expertise to the blog.